A vast roster of international political and business leaders flocked to Ma'anshan, Anhui Province on May 23 for the opening ceremony of the fourth annual Global Outsourcing Summit. 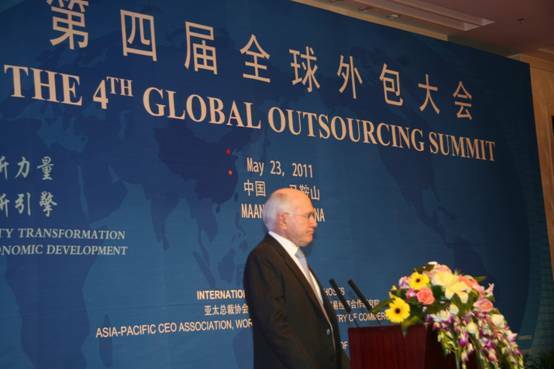 Former prime minister of Australia John Howard addresses a crowd of international political and business leaders at the opening ceremony for the 4th Global Outsourcing Summit on May 23, 2011 in Ma'anshan, Anhui Province. World leaders attending the summit include former Australian prime minister John Howard, vice president of the Asia-Pacific Association of CEOs Christian Quesnot, and executive director of the United Nations Industrial Development Organization Sui Hui. Notable top Chinese officials are also present, including China's vice minister of commerce Wang Chao, secretary-general of the China Center for International Economic Exchange and former Chinese vice minister of commerce Wei Jianguo, and president of the Chinese Academy of International Trade and Economic Cooperation (CAITEC) Huo Jianguo. Provincial and local leaders, such as Governor of Anhui Province Wang Sanyun, Vice Governor of Anhui Province Hua Jianhui, and Secretary of the Ma'anshan Municipal Committee of the CPC Zheng Weiwen, also attended the opening ceremony and planned to participate in the summit. Representatives from many Global Fortune 500 enterprises also attended. The theme for this year's summit, "International Outsourcing — New engine of World Economic Development, New Force of Chinese City Transformation" underscored China's strategy to develop outsourcing as a tertiary industry in many of the nation's cities. As China's economic structure evolves, the function of Chinese cities is gradually transforming. Officials say outsourcing centers improve the quality of life in urban areas, since it shifts the role of the urban workforce. At the summit, secretary-general of the China Center for International Economic Exchange Wei Jianguo said cities should take measures should to promote the development of China's outsourcing and use outsourcing to drive urban transformation. "In holding this Annual Global Outsourcing Summit, Ma'anshan should seize the opportunity to formulate policies, gather talent and attract investment to promote its outsourcing industry," Wei said. CAITEC president Huo Jianguo echoed Wei's sentiments, saying that vigorously developing outsourcing in China would help promote the country's economic structural adjustment. During the 12th Five-year Plan period (2011-2015), China will continue to transform its economic development pattern from export-driven manufacturing to the service sector, to help create a self-sustaining economy. Thus, outsourcing centers in China have great potential for future growth. Currently, China's outsourcing sector growth is moving from coastal cities to inland cities. Summit delegates hope to discuss how outsourcing can play a larger role in central and western China's overall development strategy. Another discussion topic at the summit will be how new technology will transform global outsourcing. Leaders have recognized that technological innovations will be a key factor in the development of outsourcing centers in China, and are the only way the industry will be able to maintain steady growth.